At the very nascence of my interest in Indian films, it flowed in two distinct strains. One was fueled by Indian art films and my discovery of Shabana Azmi. The other was driven by filmi music. I was curious but cautious about taking the plunge into full-on Bollywood films - I didn't really know where to start - but I've always had a broad, eclectic taste for music from all over the world. So I picked up a collection of Bollywood songs and started listening. I remember the first time I listened to that CD. I was riding to work on the trolley, and as the first refrain of the first track on the disc played out, my jaw dropped to the floor. I was amazed; it was the most perfect thing I had ever heard, and I could not believe it had taken me so long to discover it. It felt like coming home. That song was "Dum maro dum," penned by R.D. Burman and sung by his wife Asha Bhosle. It was gorgeous; trippy, emotive, funky, alive, and still a most delicate blend of east and west. It was only a little over two minutes long and I think I must have backed it up three times before I could bring myself to move on to the rest of the collection. Although I've discovered hundreds of wonderful filmi songs since that day, "Dum maro dum" has remained close to my heart, always a favorite, the song I credit with starting it all for me. Still, it was more than a year and a half before I finally saw the film it came from, Hare rama hare krishna. Prasant and Jasbir are a brother and sister, separated as young children when their parents divorce. Prasant (Dev Anand) grows up in India with his mother, and becomes a jet pilot. Troubled, rebellious Jasbir (Zeenat Aman) grows up in Montreal with her father, and flees as soon as she can to Nepal. There, she changes her name to Janice and becomes the charismatic leader of a rag-tag bunch of hippies, both Indian and western, who live, love, and smoke up in a commune aptly named "The Bakery." Prasant catches up with Janice and finds her badly broken by her past, living only to tune in, turn on, and drop out. Nevertheless, Prasant attempts to connect with her, to revive the tenderness they shared as children. At its best, Hare rama hare krishna is a very touching story about brotherly love, portraying Janice's damage with a sensitive and poignant touch. It suffers, though, from several weaknesses. Janice's struggle with her past is interesting, but the film takes far too long to get there - Prasant stalks her creepily for the first two thirds of the film without telling her who he is; she assumes his intentions are amorous. Dev Anand's persistent preaching against the drug-addled hippie lifestyle tends toward the wearisome, as does a confusing and irrelevant subplot about an exporter named Drona who tries to frame Prasant for theft after Prasant wins the heart of Shanti (Mumtaz), a girl Drona had his eye on. Despite its weaknesses, though, there is plenty of treasure buried in Hare rama hare krishna that is well worth digging for. Among the best aspects of the film were its two women, the heroine and the anti-heroine, Mumtaz and Zeenat. Both women are very beautiful and appealing, each with her distinct style, character, and presentation, but Zeenat - here in her very first movie - completely steals the show as the stoned, tragic Janice. Hare rama hare krishna is also interesting as a sociological study, presenting hippie counterculture from an Indian perspective. The film offers an Indian take on the phenomenon of westerners flocking to the subcontinent and appropriating its religion and philosophy, which was mystifying to many Indians. 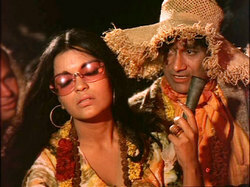 Dev Anand's view of it comes across loud and clear in his musical answer to the toke-up anthem "Dum maro dum" - his "Ram ka nam badnam na karo" ("Do not desecrate the name of Ram") is a plaintive call to lost youth, urging the stoners to find their way back to the ideals of upright Indian society. Perhaps it is telling, though, that "Dum maro dum" - not "Ram ka nam" - is the film's evergreen hit. The music alone - enhanced by with the vibrant authenticity of the Kathmandu locations where it was shot - is worth the price of the DVD. Along with the iconic "Dum maro dum," there are several other memorable songs, notably Prasant's sweet and lovely tribute to his sister, "Phoolon ka taaron ka," and Mumtaz's spunky street performance in "Ghungroo kya bole," neither of which I can find on YouTube, unfortunately.